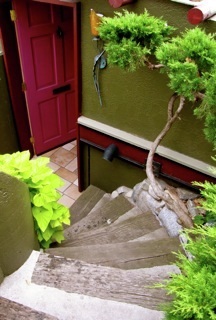 ​Steps lead down to your private abode, and you know you are entering a special place. It doesn't have air-conditioning, or bug screens. It is a unique and special experience, and our desert valley has few bugs. 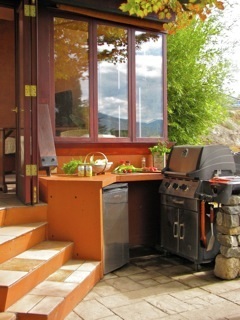 The BBQ on your patio adds another dimension to staying in to eat. At the right times, the vegetable garden yields great organic produce. Fresh herbs can always be found. Just ask! Below you is the cutting garden, where you are free to pick a posie. Note the open roof as you look down into the Cabana. Easy to operate. The system is on counter-weight with a push-pull pole. Just don't leave it open if rain threatens. In a really torrential rainstorm, with the wrong wind direction there may be the odd drip, but NOT over the bed! Tough to make a roof that opens without the odd unsurmountable challenge. An opening roof introduces you to nature, the odd leaf or other tree 'detritis' will infiltrate into the Cabana. It is impossible to stop! When the wrap around windows are open, nature enfolds you. The Cabana is a close to nature experience - expect moths at night if the lights are on, and even the odd ant may try to join you. The Cabana has seen its share of engagements, birthdays, anniversaries, honeymoons and weddings. It has been called a "nookie nest"!!!! Still quite small and compact, but with a micro/convection-bake oven which also browns. A full sized fridge and two-burner induction stove top rounds out the appliances. Of course there is still a kettle and toaster, and a french press for coffee making. The BBQ outside also has a side burner, and a cast iron pan is available. The kitchen is always stocked with basics - salt, pepper, sugar, basic dried herbs, coffee, assorted teas, olive oil and balsamic vinegar. The selection of dishes, pots, pans and cooking utensils has also been expanded. Internet will keep you in touch, if that is the deal to allow you to escape! For some the Cabana has been a creative haven, and their work has flowed. Books and games are available, and even more upon request to while away the time as your body relaxes to match natures' rhythm.